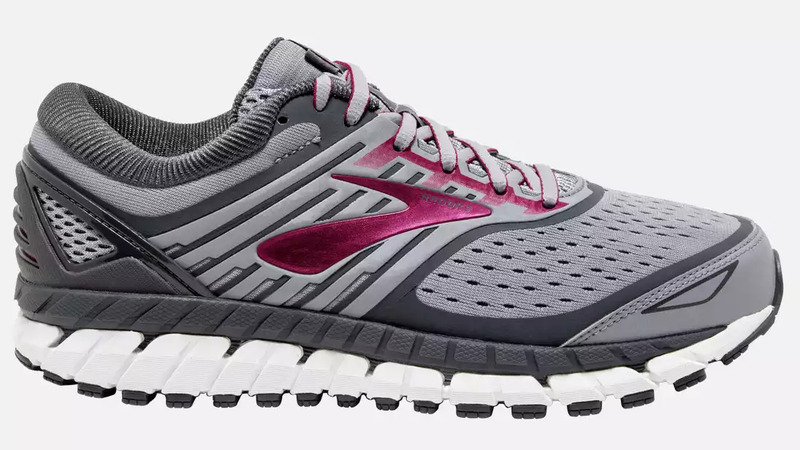 The Brooks Ariel 18 is the women's version of the Beast 18 and is engineered specifically for women. It is a stability shoe that offers maximum cushioning, a roomy toe box, and a heel counter for extra stability. It also has arch support and your orthotics will slide easily into the shoe if you decide to use them. The Ariel 18 is a versatile shoe that can be used for walking, running, working, or just wearing around town. The Ariel 18 features a Super DNA midsole that offers 25 percent more cushioning than Brooks’ standard midsole. Also in the midsole, you will find the Extended Progressive Diagonal Rollbar, which offers stability for those who need extra support for overpronation. In addition, the Segmented Crash Pad runs the full length of the shoe for smoother transitions as you move through your gait. The upper of the shoe wraps around your feet better than the previous version, which reduces the chance for hot spots. On the outsole, you will notice Omega Flex Grooves to enhance flexibility, cushioning, and durability. The outsole is made with Durable HPR Green, which is environment-friendly silica that grips to surfaces for traction. The Brooks Ariel 18 is for those who need support, stability, and cushioning to keep from overpronating.